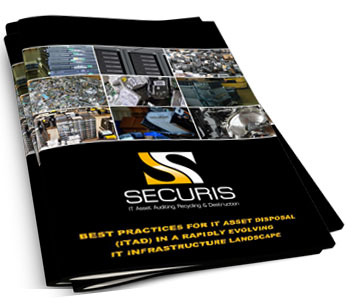 As part of its commitment to ultra-secure and environmentally responsible IT asset recycling and data destruction, Securis has achieved compliance with all major Federal, State and industry regulations. All data destruction methods meet or exceed NIST 800-88 standards, DoD 5200.22-M data sanitization and/or all different standards such as HIPAA/HITECH, Sarbanes-Oxley Act, Gramm-Leach-Bliley Act, FACTA Disposal Rule, Bank Secrecy Act, Patriot Act of 2002, Identity Theft and Assumption Deterrence Act, US Safe Harbor Provisions, FDA Security Regulations, PCI Data Security Standard, and all other various local, state, and federal regulations. Securis is R2 certified (Chantilly, VA location), having passed rigorous audits by an independent third party to evaluate recycling practices in more than 50 areas of operational and environmental performance. R2 is the leading standard for the electronics recycling industry, ensuring practices that protect the environment, human health, safety and the security of the recycling process. Securis also holds a contract with the Federal Government under General Services Administration (GSA). The schedule is 36 and our contractor number is GS-03F-0068V. This contract is for on-site and off-site shredding services, degaussing services and computer recycling. We are also certified by the Defense Logistics Information Service to store and transport military critical technical data. Our certification number is 0051653 and expires May 15, 2019. Securis recognizes the absolute need for proper domestic recycling services. Securis recycles 100% of all materials that are received at its facility in the US. Securis does not export hazardous materials to developing countries as defined by the Basel Action Networks (BAN). By complying with BAN, Securis exceeds U.S. federal mandates and instead is compliant with the widely adopted, international standard. All downstream processors that receive shredded material from Securis are required to complete an Agreement for Responsible Disposal of Sensitive Materials. At this time all magnetic media is incinerated using the cleanest methods available. Smelting documentation can be provided upon request. All metal based material is sent to a domestic based refinery where it’s refined for different types of metals.